iPhone and iPod touch users who’ve gotten used to the built-in Weather app on their mobile device may be in for a shock the first time they fire up the iPad. Apple’s latest mobile device arrives without that familiar Weather icon. But not to worry—a number of developers have stepped up to fill the gap with their own iPad-optimized apps to make checking the weather for unexpected showers or pleasant sunshine almost as easy as glancing out the window. Apart from Weather HD which we profiled earlier this week, here are a few of the apps that have caught our eye since the App Store added iPad-friendly offerings to its inventory. The app gives users weather information in a single-screen view that includes a widget panel design and a large comprehensive map. WeatherBug Elite will automatically detect your iPad’s location, skipping over any input information from you, and display portrait or landscape maps of your locale showing current conditions and oncoming storms. 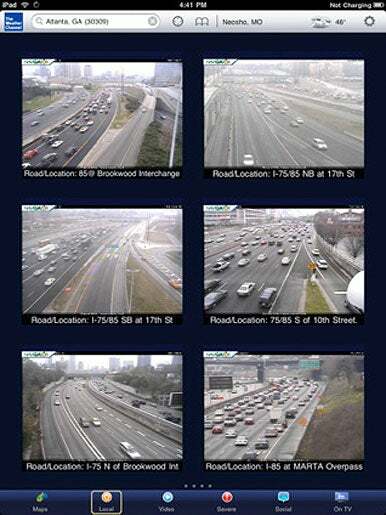 WeatherBug Elite also features 640x640 video and live weather camera images from up to 15 locations within a 100-mile radius of your location. Additional features include extended seven-day and hourly forecasts, high/low temperature readings, radar and time-lapse animation for cities inside the United States, nine contour map layers (such as current temperature, humidity, and wind speed), severe weather alerts, and daily broadcasts provided by WeatherBug meteorologists. 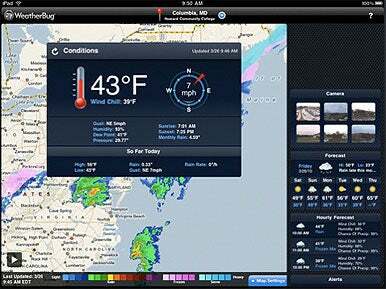 The Weather Channel also has a iPad app of its own available for free. Beside the usual weather coverage of current conditions, The Weather Channel Max also has customizable full-screen weather maps; a video library that includes local, regional, and national forecasts; in-motion radar that allows you to view past and future forecasts; storm footage; local traffic cams that you can customize; and even Twitter feeds from TWC’s on-air personalities. Developed by Weather Underground, the free WunderMap app boasts that it uses the world’s largest network of personal weather stations, gathering its information from more than 16,000 Weather Underground stations. Current condition information includes temperature, dew point, humidity, precipitation, and wind speed and direction. After you pinpoint your location—either by the search box or scrolling through a map—you can get a four-day forecast, as well as feedback from live web cams. WunderMap’s map interface offers satellite, street map, or hybrid view options. It can also conduct worldwide location searches and has GPS functionality. These three apps and the aforementioned Weather HD just scratch the surface of iPad offerings aimed at everyone from amateur weather watchers to professionals who rely on timely and accurate weather readings. Navimatics Corporation has a pair of $40 apps under the Charts&Tides+ name for your nautical needs, including charts, tides/currents readings, navigational guidance on the sea, and more for the East Coast and Gulf Coast. (The hybrid apps also run on the iPhone and iPod touch.) ForeFlight’s free ForeFlight Mobile 3 HD is designed for the pilots, displaying airport directories, global airport coverage, and flight plan filing and briefing data. Others with an iPhone who may be familiar with the AccuWeather.com app will be interested to know that there’s a $1 ad-free version built specifically for the iPad.